Take a look at the New York Times obituary of the American humorist Art Buchwald and you will see something rather strange. Yes, its a video of Art B which starts with the words "Hi, I'm Art Buchwald and I just died". According to a programme I was listening to this morning on CBC (Canadian Broadcasting Corp) this is all part of a new trend towards interactive and participative obituaries and memorials. Microsoft is seemingly working on a videopod - powered by solar energy - which can sit on the top of your gravestone and display still and video clips of key events in your life. I know this sounds daft and I would normally consign it to the "stories someone made up in a dull moment which everybody now believes" file if it was not for some independent verification of this new trend. As regular readers will be aware, I am disproportionately fond of reading obituaries. The more obscure and far distant the subject, the more I like them. I recently managed to tune my RSS reader so that it would automatically download each day the obituaries from the Aberdeen News (that's Aberdeen in South Dakota in the USA). Intrigued by one such obituary I decided to visit the Funeral Home (OK virtually visit) and maybe sign the on-line book of condolence ("I didn't know Jim but he has left a lasting impression on a resident of Huddersfield West Yorkshire"). However I was directed to another website called memory-of.com (The Library of Life). Here you can have a website set up in memory of your nearest and dearest complete with photo albums, videos, music and the ability for people - for just a few cents - to light a virtual candle in your memory. As far as I know, nobody has caught onto this trend in the UK yet and I am determined to be first on the scene. The video camera is on the tripod ready. 3,2 1 .... "Hi, I'm Alan Burnett And I Just ....."
We bought a new rabbit cage yesterday. It is an indoor cage because my wife has decided it is too cold outside for our very elderly rabbit. The cage is a substantial plastic job, of a scale and complexity which would make a rabbit estate agent salivate ("detached slumber chamber, capacious perambulatory domain" etc etc). The only way to fit this edifice in my room was to place it on "stilts" on top of a corner cupboard and the only stilts available were a couple of old box files. Doing a quick check to make sure that the boxes were empty, a photograph fell to the floor - and what a photograph it is. This first thing I must say is that I have no idea who it is. However I do remember seeing it before: several years ago when I was trying to sort out some old family photographs. At the time I asked my mother and father who it was a photograph of, and they had no idea. 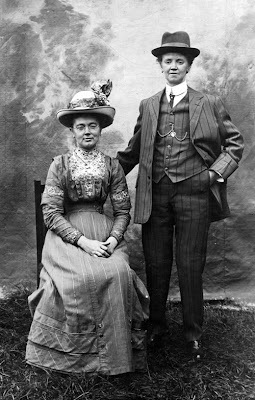 The recognised family photographs were filed away - the mysterious couple must have remained in the box... forgotten. So who on earth are this odd couple? Is it a man and a women or two women? If the latter, why the bizarre clothing? And what was the occasion? If you look closely you can see it is not a studio photograph, there is grass underfoot. Could it have been taken at a fair or a showground? It makes you want to write the back-story. Look at the faces closely. Could they be sisters? Arnold Bennett once so two such elderly sisters sitting at a hotel dinner table. His imagination was set in motion and he wrote "Old Wives Tale" (one of his best novels). There is a confidence about the two figures... no shrinking violets these .... no caged rabbits. When we were children, a film company used our house as a location for 'Seance on a Wet Afternoon', starring Richard Attenborough and Kim Stanley. By pure coincidence my mother used to know Kim but had lost touch, so they were delighted to find each other again. Pinewood Studios had rented a place for her beside the River Thames at Bray, and we went and stayed there one weekend. It was a modern house, built in the grounds of an amazing, almost derelict mansion, which we came upon when we went for a little explore. Apparently it was lived in by one old man, and was so spooky it had been used for horror films. Years later, when I wrote 'A Proper Family Christmas', this was the house I had in mind. 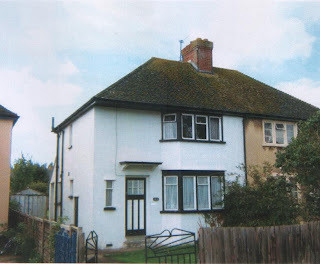 And - good old internet - I was able to find out what the house looks like now. Converted into a posh hotel, not surprisingly. Perhaps I'll wait till I'm a bit more famous as a writer before going in there and telling them the story - and trying to bum a free meal. It is Martin's 50th birthday today. Tonight is his surprise 50th birthday party (mind you it won't be a surprise party if he reads this blog during the next seven hours). Most of the morning has been dedicated to trying to find him a suitable present. I accept that I have left things late, but from an actuarial point of view forward planning is not a wise move when you pass the big 50. So what do you buy the man who has almost everything? Martin is already rich in most things : a beautiful wife, two smashing children, a lovely house, a signed photograph of Tony Blair. The one thing he hasn't got is the ability to beat me at chess, but that you can't buy that, and even if you could I wouldn't. The fact that I normally demolish him on the chess board is the one factor that keeps me from murdering him in a jealous rage. My first thought was to buy him a new chess set. We have been playing chess for decades and the set he owns (which I gave him years ago I seem to recall) has got a pawn missing which is usually replaced by a pepper pot or some such object. But it is practically impossible to buy a chess set in this twenty-first century world. The assistant at JT Sports looked at me with alarm and said "A chest set?" whilst reaching under the counter for the panic button. In another shop the assistant - in reply to my supplementary question "if you haven't got any can you think of anywhere in town which will" - said (and this is the absolute truth) "You could try Byrom Arcade, there are some shops selling occult and black magic stuff there". The best I could come up with was a small tin containing miniature wooden chess men from Waterstones. Somewhat dispirited I made my way home with the tin of chessmen in my pocket. On my way home I called into the supermarket to stock up on microwave chips and Tetleys Smooth Bitter (two of any healthy person's five a day). Whilst I wandered the aisles I thought of Martin. It must have been something like fifteen years ago : he and a friend had decided to walk from the west coast to the east coast of Scotland taking in as many mountains as they could find. As they didn't pass any civilisation en route there was a need to re-stock on the essentials at some stage. I agreed to take a train up to Scotland carrying a large bag of food and clothing and dump it at Dalwhinnie so that they could collect it when they came through. The gods were smiling on us all and my arrival at Dalwhinnie just coincided with their descent from the high mountains. They abandoned their tent for the night and we all booked into the luxury of the Dalwhinnie Hotel. As well as food and clothing I had carried a chess set up, so after a meal we sat and played chess and drank... and drank .... and drank. I still don't know how I found my way back to my room that night. The next morning with a head like a granite set I watched Martin and his friend head east into yet more mountains. I had a couple of hours to kill before my train arrived so I went for a walk down by the side of Loch Ericht. It was a glorious spring day, the sun was shining and there was still snow on the tops of the mountains. The whole place was deserted. It was one of the most memorable mornings I have ever spent. Thus it was no contest when, this morning, I walked down the supermarket aisle and saw the bottles of 15 year old Dalwhinnie Single Malt. Happy birthday Martin. I have been suffering from a dreadful case of obsession today. It has been one of those days when a stupid tune becomes lodged in your brain and you can't rid yourself of it. As is usual in such cases the tune in question is not something grand, no great aria, no fine concerto, not even something from the Cliff Richard Songbook. No, the melody - or rather the snippet of a melody - which has been driving me to distraction all day is an advertising jingle from the early 1960s for Bristol cigarettes. It starts with an opening sequence from a big band and then a relatively close harmony quartet of voices chime in. That's it - or at least that is all I can remember. I don't think the brand survived for long. It must have been in the early days of tipped cigarettes, the days when thoughts were about the flavour of the smoke rather than the toxic after-effects. What caused the tune to enter my mind today, I have no idea. It ambushed me. I was sat on a train going to London looking out of the window and generally minding my own business. And suddenly it was there. I fought against it, trying hard to concentrate on preparing for the interview I was on my way to ("Take a tip, take a Bristol"). I tried drowning it in a surge-tide of Miles Davis from my MP3 player ("Today's cigarette is a Bristol"). I sat outside the interview room in hand-wringing desperation. ("The real cool flavour you'll never forget") When my brain should have been performing like a Mercedes Benz parrying questions and demonstrating my value to the organisation in question, it was fighting against an over-powering jingle with the grace and style of a Austin Allegro ("Bristol is today's cigarette"). I can almost hear the discussion amongst the interview panel after I had left the room. "What a pity, it seemed as though his mind was elsewhere...". Little did they know that I was fighting against an addiction. The nicotine hadn't got me but the blasted jingle had. What is it about maps, and even better, aerial photographs? Why do I have such a passion for them? I think it's because it makes me feel I control the whole world. One summer when we went to stay with the Burnetts, Ali showed us Google Earth. Oh what heaven! In those days I imagined it really was live satellites spying on what was happening down below. I'm a very nosy person. I wanted it, badly. But at that time we only had dial up. It was one of the deciding factors that made me think we really must get broadband. This time last year we took the plunge. Great! Download Google Earth... check out Oxford, and our house... Oh no, nothing but a horrible blur! So when somebody mentioned it on the Romantic Novelists Association newsgroup, I replied with ‘Huh to Google Earth’. But Stephen Bowden (of the RNA University Challenge Team) has now pointed me to an alternative, called Live Search: www.local.live.com. It’s absolutely wonderful! You can see our house, our car, our old shed! (I have a posh new Writing Shed now). I can play God again. With apologies, this is not going to be a very exciting post, I'm afraid - I just wanted to find out how to do a posting! For what it's worth, this is a picture of the next house we are hoping to develop - a 1936 semi that at the moment has scarcely been modified at all since 1936 - a real period piece inside - and note the driveway down the side, too narrow for a modern car! It's in a cul-de-sac named "Meadow Prospect" - and you can see the meadow from the side of the upstairs front bay window in this picture... just about. I live on Dorchester Road. It is not in Dorchester nor does it lead to Dorchester. It is - to use that most dreadful of modern terms - aspirational. Name the street after a cozy southern town and you might forget for a moment that you are looking down on the mills of Brighouse or chemical works of Huddersfield. There is nothing particularly new in this practice : housebuilders developed the concept of spin years before the politicians jumped on the bandwagon. However, recently it seems to have spun itself onto a new, quite preposterous, level. Just up the road they have erected a series of signs pointing towards new housing developments. 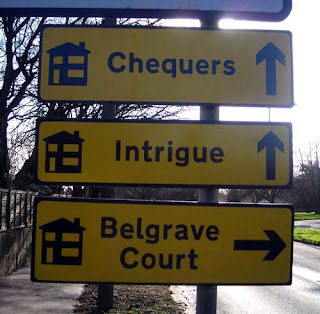 Granted, Belgrave Court is in the Dorchester Road mould. Chequers might be if it referred to the Prime Minister's country residence, but you can't be sure today. But Intrigue : what is all that about? The intrigue is why anyone would want to live in such a place. There is another sign in Huddersfield pointing towards a big mill conversion which is called "Equilibrium". In Mirfield there is a similar development called "Fusion". I am starting a new campaign for a return to good, old-fashioned street names. Names like Brick and Tile Terrace (just down the road in Brighouse), Bog Lane (that's in Leeds), Bonegate Road (Huddersfield) and Slippery Ford Lane (Bradford). And as our house backs onto the local crematorium, in future people can contact me by writing to 3, Crematorium Gardens, Huddersfield. My supposed task these last few days has been filing. As an activity, filing is of the sticky residue type : the kind of thing you turn to when even stamp collecting fails to fill out your day. My problem with filing is that I tend to read whatever piece of paper I am dealing with rather than just consigning it to the appropriate Manila folder. So when yesterday I came across a folder marked, somewhat grandly, "Archives To Keep" I couldn't help taking a dip into the murky swimming pool which is my life. The document which caught my eye was an election leaflet from the local elections held in the London Borough of Merton in May 1974. As you can see, the candidate - to be more exact one of the four candidates on the Labour Party slate, as the election returned four councillors - was none other than me. Two things must stand out to anyone who views this historical document. First, how much I looked like a convicted criminal. The look in the photograph has that element of bemused nonchalance mixed with primal fear so common in police mugshots. And second, how on earth could I describe myself as being particularly interested in local government finance? Clearly there could be no hope for such a young man. Clearly there wasn't. Whilst 198392cjh is the only person/machine/computer programme to have provided feedback to my Daily Photo Blog (see "Apple Campers Build An Endless Ring" if you do not know what I am talking about), I am pleased to say that this blog has stimulated a higher level of feedback traffic. So time for one or two words of thanks and for a competition. Thank you to the kind gentleman from roneo.co.uk who offered to help me acquire a second-hand roneo duplicator in response to my posting "Roneo, Roneo ..." I am currently in negotiations with my dear wife to see whether space can be allocated. Thank you to the staff at Channel 4 News for their kind words in response to their award of News Podcast of the Year. I am searching for a suitable trophy and will let you know when one has been found. Thank you to Paul Bentley for the suggestion that we co-write the movie about old post-cards. If we don't manage the movie script perhaps you should turn the idea into a song for your next CD. The title will be easy : "My Dearest May". And thank you to the kind people who have e-mailed me to say that they are enjoying these postings. A special word of thanks must go to my good friend Edwin who not only sent me such an e-mail but also an attached image which he thought I could add to my collection of "zany photos" (I must point out Edwin, that these so-called zany photos are mostly members of my near family). Nevertheless, back to the image. Edwin suggests that "it is up to the beholder to imagine" what on earth it might be. I know what it is (Edwin provided the solution) but I am prepared to offer a case of Grolsch to anyone who gets close. I have slightly changed the base image to make it more interesting. The usual rules apply about the competition not being open to Edwin Osborne, his relatives or employees. This entry is being written by a human being. I am sure it is. You can tell can't you? Amongst the ways that you can tell is that it is logical, it does not contain a series of alarming non sequiturs, it is not peppered with words designed to appeal to search engines, and it does not attempt to disguise potentially prohibited words with carefully placed symbols. I feel the need to include such a statement of QUALITY assurance for two reasons. First, I received the first comment on my parallel blog "The Daily Photo Blog" yesterday. She stood in the driveway and directed traffic with the side branches of a fresh cauliflower. Sorry about that : as I was saying. Some nice chap called 198392cjh (what possessed his parents giving such a name to a child?) wrote in saying what a lovely and well-kept blog it was and how I should keep it up. Indeed, he implied in was the very vi@gr@ of blogs. Would I care to view his blog, he asked, and kindly provided a link. His extremely interesting blog was all about how to make MONEY on the web and he had hundreds of comments from people saying things like "Glad you liked my blog, yours is good too". The rain fell like a guardsman's trousers and she penned quadratic equations on her mother's arm. I should have realised that 198392cjh was a machine. As a general rule, you can be sure that any NICE comment you receive over the internet has been generated by non-human means. It will have originated from a li@ison between code and programme rather than being the fruit of any breathing person's loins. This takes me on to my second reason, and that is sp@m. As far as I know, nobody has yet written the definitive history of spam, but it is a JOB I quite fancy. The garage was almost full with loan applications but eternal youth left by the bathroom window, only to drive down holiday memories in the prime of success. It used to be easy to detect spam. You could set up filters designed to rid you of messages on how to maintain an ******* and have ****** the size of ***********. Then people got CLEVER. The next line of defence was to scan the title of the piece and root out "I Can Guarantee To Make You $400,000 in a week" postings and others of a similar nature. But then people got CLEVER. She scrubbed the possum with butterfly wax to see the next trophy on the shelf. The latest thing seems to send spam e-mails containing almost random sentences. Just a few examples from my current in-tray will illustrate my point: * "If you did, brown stubs would stick out above the leaves. Have all children exit the vehicle from curb side doors". * "Is this spoken word technology the "missing link" for health transformation success?" 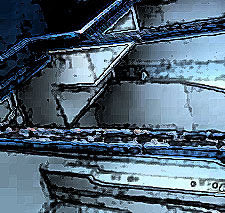 * "The briefcase came hesitantly into the room, carried by a grayhaired year, so it could spare a few volts now" The idea seems to be that you contain your real message selling your vi@gr@ or your ***** enlargement pills in am image at the top of the message. The image will not be picked up by your filters or your auto-preview, which will just report these randomised sentences. The odd thing is that some of the resulting passages are quite beautiful. In some ways it is an art form. For weeks I have been collecting these things with the idea of building them into an epic poem. I haven't got far yet. Here is the first verse (all quite genuine lines from spam messages received by me): Like an idol, she gave only one thing, Then twisted the nozzle off and walked away, Apple campers build an endless ring, When they see Fido walking that way. I will keep working on it, but please do not take this as an INVITATION to send me potential material. 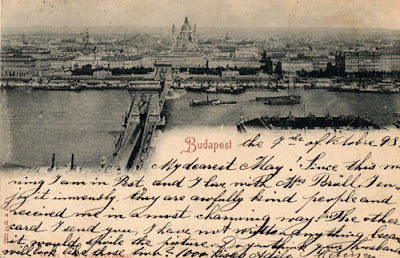 Many years ago I had a phase of collecting picture postcards. The ones I was most interested in were early ones - around the turn of the (last) century. For me, the joy of a good antique postcard was not just the picture which was on the front, but also the message which was attached to it. There was a little second-hand shop in Rotherham where I used to be able to pick up the occasional bargain. The owner would look out for postcards which might interest me and put them to one side until I next called in. The example above, was bought from that shop. It dates from 1898 and - like several others in my collection - it was sent to Miss May Chambers of 99, Burngreave Road, Sheffield. I am not sure who it is from - the signature looks like Adele Fleming - but I am not sure. Who were these two? What was Adele doing in Budapest "staying with Mrs Brall"? And what of this other card which is mentioned? It is not part of my collection I am afraid. "Do you think your husband will look like these two?" Is May to marry a Hungarian Count? Has Adele gone on a tour of Europe to find a possible husband for her friend? It is all so intriguing. Trawling through Napster's Just Added section is a curious business. It is a little like wandering through an airport far away from home. It is full of strange names in strange languages. Renaud Garcia-Fons rubs shoulders with Bernardo Sassetti as they walk past Kwaku Kwaakye Obeng. Occasionally you come accross a famous name or a face you recognise - isn't that Django Reinhardt over there and the guy he is talking to just looks like Duke Ellington. And then, just as you are feeling a little homesick and very far from the comforts of home, you see a familiar face - someone you never expected to meet in such strange surroundings. Yesterday, I discovered Paul Bentley's new CD - "Come Sunday" - on Napster. I first met and heard Paul some three years ago when we invited him to do the "Midnight at the Mechanics" session at the Marsden Jazz Festival. He went down so well, we have had him back every year since. He's class. But unless you live in the North of England you probably wouldn't know it. Well, that is until now. Thanks to Napster and other download sites, Paul can go global and that is just another reason why the new digital landscape is a more positive environment for performers than the old hierarchical commercial system. So what of the CD.It is Paul's first album and it features Paul on vocals with Les Chisnall on piano and - on some tracks - Iain Dixon on clarinet. 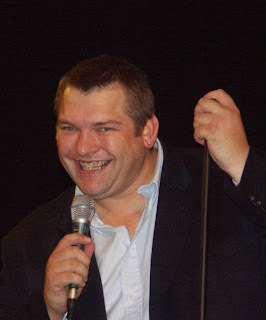 The choice of songs reflects both Paul's versatility as a singer and the range of his potential audience. There are a good few swinging standards there - the kind of material which has sold out his Marsden concerts over the years. The opening track "Let's Fall In Love" sets a high standard : a standard which is met by a number of other selections from "The Great American Songbook" such as "Paper Moon" and "Smile". One of the great discoveries of the CD however, is Paul's ability to take material which is slightly less familiar and make it resonant and memorable. My particular favourites are his treatment of that great Bill Evans number "Waltz For Debby" and his version of the James Taylor tune "You Can Close Your Eyes". The other discovery is his ability to deconstruct a song in a similar way to Kurt Elling (who has always been a particular favourite of mine). A sign of quality in a singer is that they are never afraid to slow things down. Just listed to his treatment of "My Foolish Heart" and "Body and Soul". It is a lovely album which blends the familiar pleasures of a timeless voice with an ambition that allows it to occasionally stray from what might be safe and clichéd. But don't take my word for it. You can download samples from Paul's website or the whole thing if you are a subscriber to itunes or Napster. A rare visit to watch a live football match yesterday brought back memories of the days - in the early 1960s - when my father and I turned out regularly to watch Halifax Town at the Shay. Football was a less professional affair then and stadiums were far removed from the complex entertainment complexes they are today. Back in the 60s, the pitch was ringed by a somewhat crumbling concrete wall. My father and I would take up position, leaning against the wall, at a point somewhere near the halfway line. Now my father and I were both deaf in our left ears. There was no link between these conditions: it was not hereditary or anything like that. It was just bad luck. If you are deaf in one ear, you soon learn to always position yourself so that the person you might be talking to is "in your good ear". Nowadays this is known as a "coping strategy", back then it was just something you did. So when we got to the fence, I would take up a position to the left of my father, so that he was next to my functioning ear. But - you will have worked it out by now - this meant that I was next to my fathers' non-functioning ear and therefore changes were necessary. For some reason there was always an unwritten and an unspoken rule that you would not just move in these circumstances. After all to make things better for one of us would automatically make things worse for the other. Such conflicts were always thoroughly veiled in our family. Subtlety was the order of the day. So after a few minutes my father would go and buy a match programme and then come back taking up a position to my left. 15 all. I would go and buy a bag of crisps and a bottle of pop and on my return take up a position of his left. 30 - 15. He would buy a pork pie. 30 all. I would go to the loo. 40 - 30. And so it would go on for the full ninety minutes. The result of all this was, of course, that we would slowly but surely move around the perimeter fence in a strange worm-like movement. Where there were other fans in the way they would move aside to let us pass. We had become a regular feature of matches, they knew us and our strange ways. We would normally finish up at the end of the match behind the goalposts. We were the peripatetic supporters. Uncle Harry would have liked to feature on the web. He liked that kind of thing. I remember how proud he was when he was on television once. It was the late 1950s. He was playing piano with a drummer called Geoff and they had a weeks' contract entertaining at the social club of a caravan park just south of Bridlington. The new commercial television channel had a nightly regional news programme and to play it out they usually featured a local musical act. For some reason the producers hit on "Harry and Geoff" and the cameras turned up at the caravan park to film them. Part of the contract was a free caravan for the week and I was staying along with my Auntie Annie, so I remember being there at the recording. These were black and white television days. For some reason white shirts never appeared white on monochrome television at that time and therefore they had to wear dreadful lemon-yellow shirts and thick skins of make-up (Uncle Harry would have quite liked the latter). After the filming, I remember him saying to me : "That means I will be immortal, that film will live for ever, long after I'm gone"
Uncle Harry was around for another twenty-five years and I strongly suspect that he outlived the film by a couple of decades. But if he had lived long enough to see the internet he would have been quite keen on the idea of appearing on it. "That means I will be immortal", I hear him saying, "that blog page will live forever". So here is Uncle Harry. He's the one on the right wearing the plumed helmet. The picture dates from the early thirties, I suspect, and at that time Harry was making a living as a travelling playing in a pierrot show called "The Silhouettes Concert Party"
I have a copy of the programme for the show dated Monday 14th September 1931, when the Silhouettes were playing the Pier Hall, Bognor. 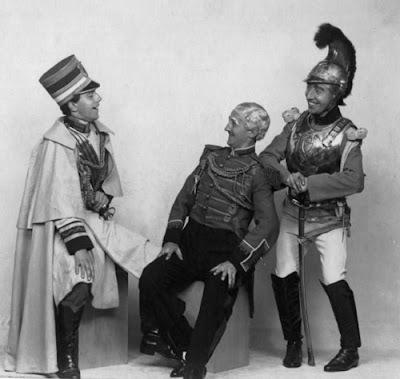 The cast includes : Harry Christian (Comedian : late of "Catlin's" and own show); Elsie Prince (Soprano : late of "Farce" and other leading concert parties); Audrey Hawke (Soubrette and Dancer : The well-known young Pantomime Principal Boy); and Harry Moore (Pianist and Tenor Vocalist). According to the programme : "their humour can be thoroughly recommended to all who love to laugh, while patrons to whom Art and Music appeal strongly will find that their tastes have been well catered for". The show is billed as "The Acme of Perfection in Pierrotic Entertainment"
I returned to the Southern Californian city of Goleta today. It must be five years since I was here last and much has changed. Although it was in Goleta that I abandoned my attempt to cycle up the west coast of the United States, today's visit filled me with renewed enthusiasm for the project. All I need now is a bicycle. I feel the need to explain coming on. Back in 2001 I found myself with a fat stomach, a desk-based job, an exercise bike and a new permanent internet connection. I hit on a routine of using the exercise bike each day, carefully calculating the distance I had "travelled" and plotting it on a map. I decided that I would undertake the first ever "virtual cycle tour" in history - from Los Angeles to Seattle. I would use the project to chart the ever-increasing availability of on-line information - so I could use the web to "see" what I would have been seeing if I had undertaken the journey in real life. I set out from Union Station in Los Angeles and for the first few days the task was relatively simple. There was an adequate supply of on-line maps, photos and information resources to feed my imagination. Within a week (or so) I had reached Santa Barbara and I was enjoying the experience so much I had mapped out the book tie-in and the film of the book. 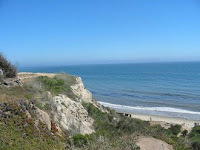 And then I got to Goleta. Or rather I didn't get there. Back then, there was nothing available. No websites, no blogs, no image banks. Nothing. I tried alternative routes out of Santa Barbara, but unless I headed back to LA, it was pretty clear I was heading for a cyber wilderness. I abandoned the project. The exercise bike rusted up and I invested in some new clothes - a convenient couple of sizes bigger. Whilst trying to write a piece on the new German Presidency of the European Union today, I had a sudden urge to do almost anything else other than complete the task in hand. So after a good few hands of solitaire I decided to take a return trip to Goleta to see what had been going on in the five years or so since I was last almost there. And what a change there has been. It's a city now (congratulations guys) and there exists enough information to keep even a nutcase like me happy for hours. I have even checked out the next few places on my route : Solvang, Lompoc, Santa Maria. They are all now website-rich. The problem is that I dumped the exercise bike years ago. eBay here I come. I have often been asked for my recommendations in relation to news podcasts (OK, one person asked me but don't let that get in the way of a good intro). It is a subject that Amy and I have made a detailed study of over recent months (Amy is the dog, by the way). Each day she demands walking and I take the opportunity to catch up with the world's news whilst we sniff out the local highways and byways. So I can now announce the winners of the 2007 International News Podcasting Awards. The winner of the best daily news podcast has to be the Channel 4 Morning Report podcast. Whilst it concentrates on UK news it still is worthy of an international audience as it has developed a style and content of its own rather than just mimicking the existing styles of radio or newsprint. It has a freshness and a vibrancy which make it a pleasure to listen to. The winner of the best newspaper-based podcast category is the New York Times with its Front Page Summary. No frills, no attempt to be anything other than what it is. But within the space of five short minutes you can get a good impression of what America might be thinking. There are joint winners in the local news podcast category - Chicago's NBC5 News Podcast and the Denver Post All News podcast. It must be said that these were the only two entries in this category but they both deserve an honourable mention for nothing else other than their obsession with the weather. There is a perverse pleasure in listening to someone elses' weather forecasts. This year the prize for making the most news out of the least activity goes to the Australian Broadcasting Corporation's AM Daily Podcast. Getting 30 minutes out of the days developments in Australia is an achievement worthy of both note and award. The prize for the most esoteric subject matter must go to the Canadian Broadcasting Corporations' Editors' Choice podcast. Who on earth the editor in question is I have no idea but over recent weeks they have served up a truly esoteric menu including "the end of faith", "brain candy", and research into potential cures for hangovers! That just leaves the prize for the most ridiculous news podcast, and that has to go to the CBS iCast which seem to be always in search of an even lower level to drag news reporting down to. At times one is tempted to believe that it is nothing more than a rather clever satire on American news coverage. But the chances are that it is for real. One recent lead story stays in my mind : "America's longest living ex-President is no longer Gerald Ford. He's dead"
So that's the 2007 awards. Any nominations for the 2008 awards - send them in now. Amy and I have a lot of walking to do. One of the great things about downloading music is the freedom it gives you to experiment. When I bought my first LP, almost forty years ago, it took two weeks of hard saving to pull together the thirty shillings or so that it cost me. With a purchase of that scale you couldn't afford to experiment - you had to be pretty sure you would be happy with the end-product before you handed (what felt like) your life savings over the counter. I suppose it could be argued that you appreciated the end-product more because of the sacrifices you had made. But I have never been much of a one for sacrifices. With downloading, once you have paid your subscription you can download to your heart's content. If i could remember any of the economics I once taught, I could argue that the shape of the demand curve changes : but I can't, so I won't. So I made this New Years' resolution to download something new each day and to experiment where possible. Two days in, the results are mixed. Yesterday was a disaster (rap is and surely will always be nothing more than an embarrassment). Today was a much better experience. 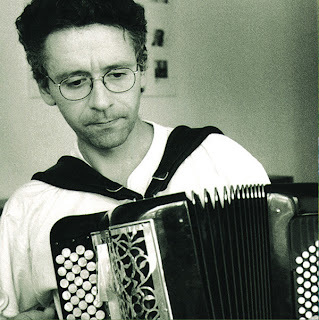 The CD in question was "Confluences" by Jean-Louis Matinier which brings together the accordion of Matinier, the flute of Bobby Rangell, the guitar of Nelson Veras and the bass of Renaud Garcia-Fons. As the title suggests, it is a coming together of styles - ethnic, classical and very definitely jazz - producing a rich and memorable experience. Catch it if you can. It was 1968. 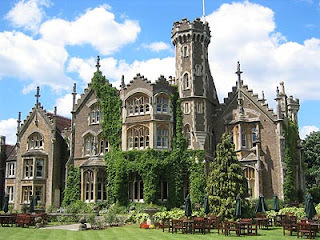 I was spending a year at Fircroft College in Birmingham. The swinging sixties had just split in two : one faction dedicated itself to overthrowing capitalism, the other to peace, love and chemically-induced oblivion. I hung around with the first crowd. Whilst at Fircroft a small group of us had produced a College Magazine (called, if I remember rightly, "The Firker"). Produced from Roneo stencils cut on my old portable typewriter, it was a mix of satire, poetry and political communiques. At the end of the year we all went our separate ways: mostly onto one university or another. Three of us, Alan Carr, Richard Frost and myself decided to take the old College magazine with us. We would publish it from three centres : Belfast, Lancaster and Stoke-on-Trent. We would all contribute freely and within a relatively unstructured framework. We would call the resulting magazine "News From Nowhere". It would be a vehicle for our thoughts, our fears, our loves and our discoveries. We had two thousand sheets of headed notepaper printed and went on our way. Sadly, not a word was ever written, not an issue ever produced. "News From Nowhere" lived up to its name in a way none of us would have predicted. What we had done, of course, was to invent the first blog. Sadly, the technology was not available in 1969 to enable the idea to come to fruition. How many of us would be blogging today if we had to cut each entry onto stencils, wrap them around an ink-filled drum, print off piles of ink-smudged copies and post them to readers all over the globe? However, when I started this blog, several months ago there was only one possible name for it : "News From Nowhere". But to be the true inheritor of that concept developed thirty-odd years ago, it needed to be more than just me. With my old friend David Hornby joining with me in producing the News From Nowhere blog, we have, at long last, the true realisation of that idea. After thirty-seven years of silence, News from Nowhere has finally come home. Hopefully, over the coming weeks and months other voices will be joining us (Alan Carr and Richard Frost, where are you now?). All we need now is an old Roneo machine. I am trying to think of a suitable topic and style with which to make my entrance, or better, opening contribution, to NFN. In the spirit of the day (the first of the Calendar Year in the UK), perhaps I should make it suitably optimistic and forward looking, with a good measure of self-inflicted (pointless, but worthy) resolutions of the "drink less, eat less, exercise more" variety. Or, maybe it should lay forth a selection of forthcoming Blog topics (presumably there is an appropriate expression for such items?). The "Art of Bob Dylan", "Scientists and Science ain't what they used to be", "Was Django Reinhardt really a jazz musician? ", "Did Louis Armstrong and His Hot 5/7 make the first punk recordings in the 1920s?" Well maybe both. Anyway, for now it's hello from me and I look forward to keeping my 2007 resolution of more Blogging than last year!